This business centre is just moments south of Saddar Town and Chundrigar Road. This is one of Karachi's most prestigious business addresses, boasting sea views and comfortable and efficient business workspaces. The centre is surrounded by a variety of coffee houses, eateries, banks and a supermarket. Clients of the space benefit from excellent access to both Saba Commercial Area and Tauheed Commercial Area. Opening in July 2018, this centre is perfect for an client looking for a professional yet modern and fun environment to work in. With both co-working spaces and private offices available, clients can choose the option that suits their business the best. High speed Wi-Fi, printing and copying facilities which are backed by self service bars as well as 24-hour secured access ensures that clients and their work is not only safe but that then can work efficiently and productively. In addition to the administrate support and reception services, tenants can enjoy their time at work with a lounge area to relax in and socialise. Located in a Grade A building in the heart of Clifton, clients have everything they need right at their doorstep. With Karachi Cantonment Station and D.C.O.S (Halt) Railway station near by, clients can access this building easily if commuting by public transport. For those who choose to drive to work, secured parking is available to use. There are many restaurants, cafes, shops and banking services all within walking distance. This business centre is located in downtown Karachi, and is surrounded by many diverse business neighbours. Offering a range of work-space solutions, business support services and more, in a superb location, highly accessible and ready for your business. The centre boasts excellent access to a variety of local amenities including tea shops, food outlets and places of cultural significance such as the National Museum of Pakistan and the Supreme Court of Pakistan. A prestigious business address in the outskirts of the central business district of Karachi. This business centre has easy access to the centre of commercial life in Karachi and Karachi Port. It also features excellent views of the city skyline. The centre is situated on M.T. Khan Road, near the intersection with Mai Kolachi bypass and City Station Karachi Circular Railway is a 15-minute walk from the building. These furnished and unfurnished office spaces are located within a modern building which prides itself on its use of green technology. Situated in the heart of the financial district this centre is near to major wholesale markets as well as other businesses and amenities. A modern office space featuring floor-to-ceiling windows which offer spectacular views on top of the regular amenities like high-speed internet access, telephone services, printing and copying facilities, and meeting room access to meet your every day business needs. 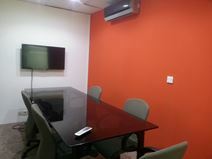 Situated on Shahrah-e-Faisal road in the middle of Karachi's business district, this centre provides a variation of office space types from private offices to co-working spaces and virtual office solutions, all suitable for entrepreneurs, startups, and international clients looking to expand in a new market. Closely connected to the airport, seaport, trading districts and industrial areas this centre is a great place to set up your business to create new opportunities.